Still wanting to see a Puffin? 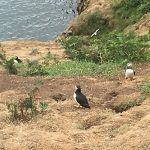 I took a visit to Skomer Island this week-into the last few days of the Puffins on the island for 2018. 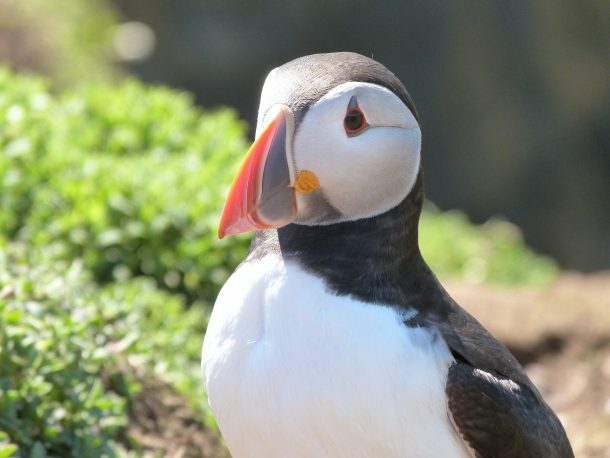 It has been a great year for Skomer Puffins–over 30,000 puffins were counted this year, and as far as a population is concerned, Skomer Puffins are bucking the trend, as other Puffin colonies elsewhere in the world are declining. So much so, that the Puffin is now classed as an endangered species. Puffins still to be seen, if you’re quick! We are now at the end of July, and the majority of the Puffins have already left now to go back to sea. Other than the breeding season, the puffin spends all it’s life at sea. 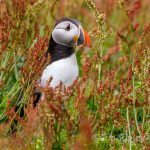 We are very lucky to have the lovely Skomer Island only a short 15 minutes drive from us here and so, visiting the Puffins together with everything else that’s on Skomer is a frequent day out for us! 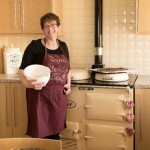 It’s no surprise then that one of our tag lines for our business is ‘Fields Lodge…home of the puffin’, as. although we do not have any ‘live’ puffins here, we do have a few inanimate ones scattered about! So, my day started with arrival at Martins Haven at 7.30am, and the queue for tickets was half way down the hill already. I was lucky enough and got one of the last remaining tickets for the first boat that left at 10am. Ticket in hand, I went back to my car to enjoy one of our Breakfast Hampers, prepared by Rhiannon for me. 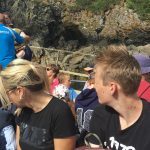 This easily utilises the time between buying the ticket and the departure time of the boat, as they like you to be on the pontoon waiting for the boat 15 minutes before departure. Once on the boat, it is a nice 15 minutes crossing on the ferry to the Island. 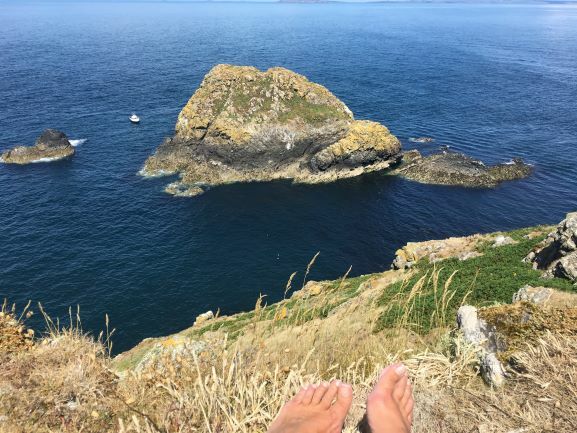 Depending on whether it is high tide or low tide, will dictate how many steps you have to climb to get to the top of the island and the meeting point. I was lucky-it was high tide, so not as many as I have navigated in the past! Once at the meeting point, one of the wardens gives a short talk about how to respect your environment whilst you are there, things to look out for and suggested places for your lunchtime picnic. And then off you go. Even though you have arrived on a boat with 49 others, and there will be at least 3 other boats later that morning, it is very easy to find yourself alone, if that is what you would like, and you can stand on a pinnacle and look around and have all this lovely island to yourself (for a few moments). As we are at the end of July there are only a few puffins left on the Island, a few feeding some late pufflings but by far, the most puffins that have remained are the juvenile ones that are now investigating the burrows left empty and choosing one ready for the following year when they will start their breeding activities. During the breeding season, these juveniles remain on the bottom ledges of the cliffs, just spectators–but learning the whole time! If you follow the path around Skomer you will find yourself at Garland Stone and this is a great place to watch seals, as they love basking in the sun on the rocks here at low tide. The day I was there, a large bull seal was basking and had his siesta interrupted by the incoming tide–one minute he is lounging on a rock, the next minute, the rock is submerged again until the tide start to recede. So, my lunchtime entertainment was a basking seal and a young seal playing around in the water, which was clear enough to see down quite a few metres. Glorious entertainment! The island is also home to the largest population of Manx Shearwater and as I was walking past some undergrowth, one chick was shouting out for some food–he’ll have a long wait, as the parents do not come back until nightfall. It’s a haunting call, and should you ever stay on Skomer overnight, the sounds of all these adult shearwaters coming back to the island at dark is something to experience. In days gone by, the shouts were said to be the souls of old seamen who had died at sea! Spooky! If you listen to the clip below, you’ll first hear the gulls but then listen on to hear the shearwater…. Skomer is by no means just about Puffins though……any minute now, we’ll have seal pupping. So, there is always a good reason to visit Skomer-watch this blog for more information as the months progress. You can visit Skomer up until the end of September each year.